In 2016, Rose Community Foundation launched a philanthropic challenge to answer the question, What idea could you bring to life to empower youth to make the community better? The effort awarded $250,000 in grants and support to implement the winning ideas. A total of ten projects were awarded the grants. Four of these projects were youth awardees, or ideas submitted and implemented by youth in our community, and six were youth-adult partnerships. The youth projects each received $5,000 in support, and the youth-adult partnerships each received $30,000. Offering youth tools to explore difficult social issues in a safe, honest and compelling way. Guiding high school freshman with mentor-matching from high school juniors. Building one-on-one relationships between teen volunteers and nursing home residents. Recording the stories of assisted-living residents —documented by teens. Using stories, music and applied theater to address the school to prison pipeline. Training refugee and immigrant teens as interpreters for their families and communities. Empowering Native Youth in Metro Denver, Spirit of the Sun, Inc. Engaging Native youth from across the Greater Denver community in a leadership conference. Empowering youth to help residents of Northeast Denver create home gardens to grow vegetables. Building relationships between students at Manual High School and law enforcement. Creating a youth-led and youth-staffed bicycle library and repair workshop in the Westwood neighborhood. Developing student-driven, social-impact leadership for the next generation. Creating a film and multi-media campaign to educate teens about breaking the cycle of relationship violence. Creating a curriculum and training for immigrant and refugee youth to become peer mentors on social and cultural issues. Innovate for Good, a philanthropic challenge to find and fund new ideas, was created in 2015 by Rose Community Foundation. In its first year, nearly 400 ideas were submitted by people, nonprofits, businesses, government and community groups in response to the question, “What new and innovative idea would you bring to life to make the Greater Denver community a better place to live?” After a community review process, nine winners were awarded funds totaling $250,000 to make their projects happen. An educational text-messaging system that sends parents evidence-based tips to support the development of very young children. This iteration will expand to also provide parents with localized community resources and information. Watch a video about their project. A design competition for students attending Metro State University of Denver, created as a mechanism to remove trash from the South Platte River. Underserved youth will learn about urban design, creative placemaking and economic development by producing a master art plan and public art series encouraging pedestrian use of the light rail and 10th Avenue, in the La Alma neighborhood. The Fresh Food Connect application (app) will feed families, reduce waste and provide income to low-income youth by allowing home gardeners to donate extra produce for distribution at food banks and through affordable sale. The app will connect gardeners to youth who will be employed to pick up and deliver donated produce using bikes and trailers. This program will forge a partnership with other community stakeholders to engage high school kids in becoming peer presenters in the areas of racial equality, community awareness based policing and justice advocacy work. This “food truck for the arts” will provide affordable, high quality theatrical performances to high school students in school parking lots followed by actor-led workshops to support classroom teaching and learning. The Stompin’ Ground Games is a monthly, year-long Olympics-style competition between Denver neighborhoods where arts, culture and history are combined in the name of civic pride and engagement. Military veterans will help grow and sell fresh produce and share knowledge about planting, harvesting and nutrition through farm stands in neighborhoods with limited access to healthy foods. A workshop on wheels truck will be outfitted with all of the tools and materials ‘Be the Gift’ volunteers need to complete home repair projects for single mom families. Community partners – CoBiz Bank and 9News – helped us make this unique program possible in 2015 and 2016. If you have questions contact Sarah Indyk at sindyk@rcfdenver.org or 303.398.7416. 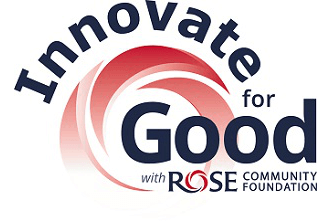 Rose Community Foundations names Innovate for Good 2016 Awardees. At our 20th Anniversary celebration Jennifer Atler Fischer, champion for Innovate for Good, announced the project’s nine winners. Innovate for Good is a new project to fund new, innovative projects to make the greater Denver community a better place to live.